Japanese rice paper rolls are called Nama Harumaki and are a popular light dish or appetisers. ‘Nama’ means raw and ‘Harumaki’ is spring roll. The spring rolls are made from wheat sheets but they have the same shape as the rice paper and is not deep fried, so Japanese people call it ‘raw’. 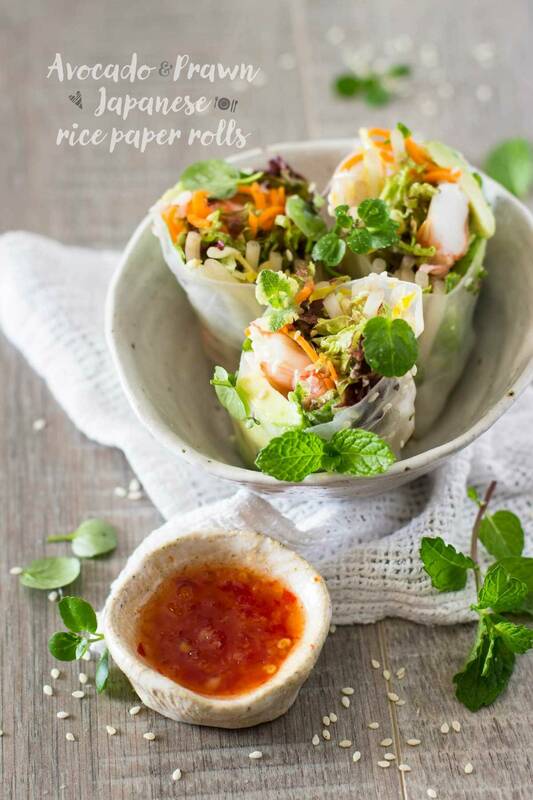 Japanese rice paper rolls are very light and refreshing using fresh cooked seafood and fresh vegetables. So they are very popular diet dish for many Japanese woman and I am one of them. They are also great for appetisers or for a light lunch like I usually do here in Australia. I call this ‘Japanese’ rice paper rolls, but Nama Harumaki is an adopted dish from Vietnam. It was too exotic for my mom, so she did not make them often and I did not eat Nama Harumaki until I left my parents’ house and lived myself. Also because most of the fillings are raw as well, my parents and many elder Japanese people are not used to eating carrots and bean sprouts raw which are usually used as fillings. When I came to Australia, my children were kindy and primary school age. I was so surprised to see young children biting whole carrots. They were not even chopped up for their small mouth. Because back in Japan, I believed carrots needed to be cooked and did not know they could be eaten raw. So when my parents came to visit us in Australia, they were shocked that my children were biting the raw carrots. My parents thought I was such a lazy mother who would not cut up food and cook for my children. No wonder because most Japanese mothers are so dedicated to creating a beautiful and nutritious lunch box for their children. 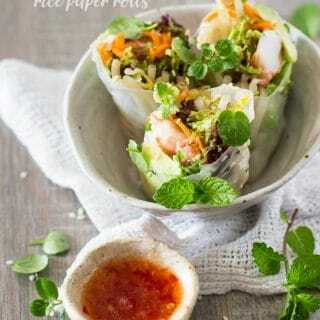 I used Australian avocado and freshly caught Australian green prawns for these Japanese rice paper rolls. As a little country girl in Japan, avocados were unheard of. I did not know how delicious and nutritionally rich they were until I came to Australia. I have learnt so much about Avocados from Australian Avocado.com. If you would like to know more about Australian avocado, visit the web and learn how to pick avocados and more great recipes using avocados. Rice paper rolls are readily available from any supermarket’s international food isle. Be careful when you handle the rice paper. 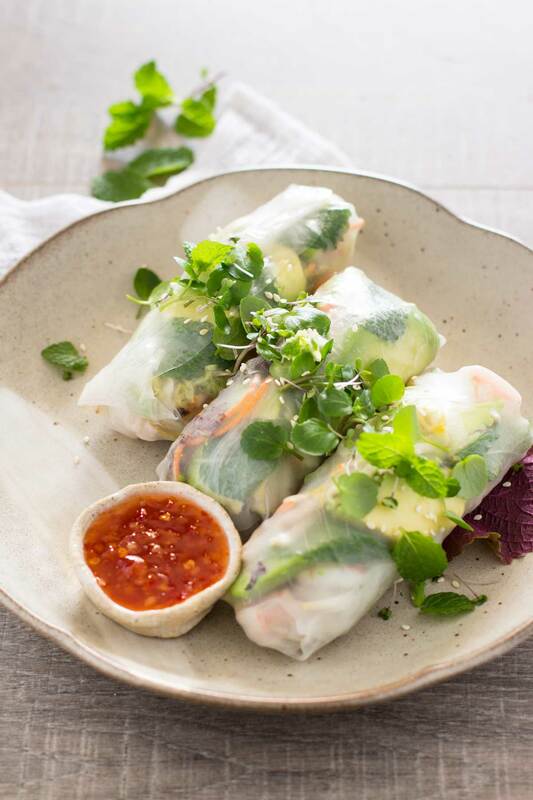 The dried and hard rice paper need to be soaked for only 30 seconds in water or lukewarm water and taken out when still slightly stiff onto damp kitchen cloth. It is very sticky once it is soaked in the water. There is a special plastic gadget to do this job. I don’t have one, but certainly it would make make rice paper rolls easier. I hope you enjoy making Japanese rice paper rolls and snap photos of your creation and hashtag “#chopstickchronicles”. I would love to see your creations on Instagram, Facebook, and Twitter! Japanese rice paper rolls are called Nama Harumaki. 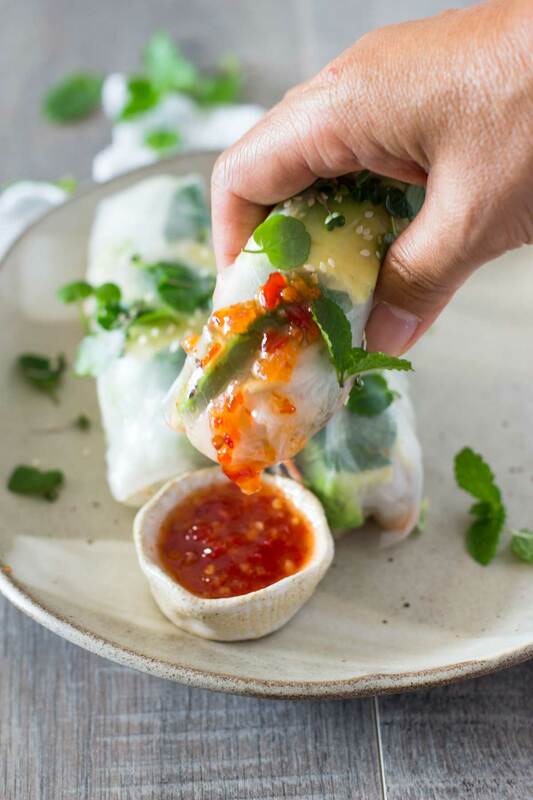 Japanese rice paper rolls could be made in 15 minutes with fresh Australian avocados. Cut carrots and shred lettuce. Peel cooked prawns and set aside. Deseed the avocado and slice them thinly. Place the rice paper on dump kitchen cloth. 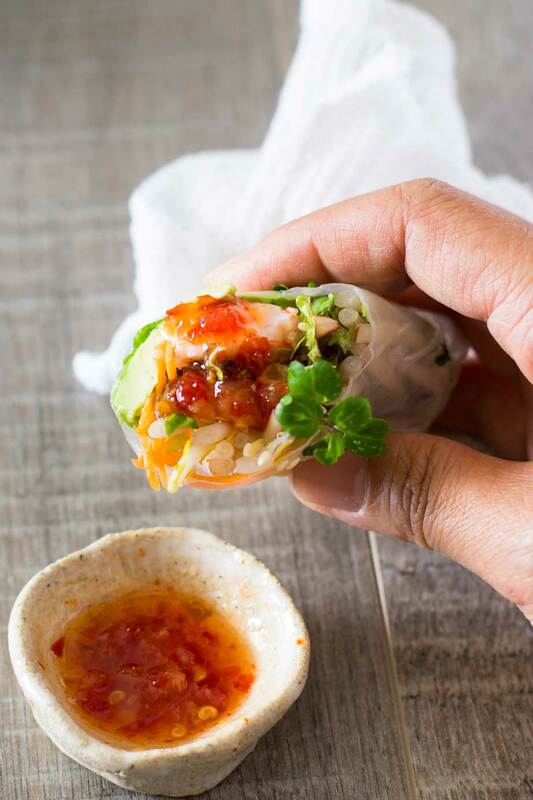 Place the fillings on the centre of the rice paper and fold the both side in and roll. Repeat same for other three. I have never heard of Japanese rice paper rolls before. How are they different from the Vietnamese rolls? 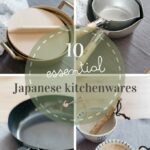 Or are they similar with more Japanese ingredients? These look wonderful and delicious 🙂 Just discovered your blog and loving all the recipes! These look so tasty. We are pinning them to make very soon! I also absolutely love your presentation. What beautiful dishes! Thanks very much. 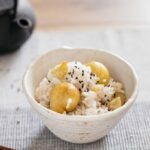 I love your blog – it is a fantastic resource for gorgeous + delicious Japanese recipes and always such a pleasure to stop by!